Rarely does a memoir from a relatively unknown author so quickly become a New York Times Best Seller and then turn into a star-studded movie just a few years later. Elizabeth Gilbert wrote Eat, Pray Love after her travels to Italy where she ate and enjoyed life, India where she learned about spirituality and prayed and finally to Bali in search of a balance to both of these experiences. Here she found her true love and a restorative haven that today has become a favorite travel destination for not only this author but many other adventurous explorers. 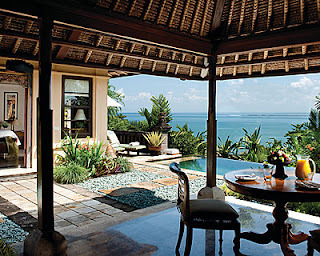 Visit Bali and the exceptional resort, Four Seasons Resort Bali at Jimbaran Bay, where you too can find a mystical land with breathtaking views. Bali doesn't even have to try to be a romantic destination, it just simply is. The phenomenal views of the Indian Ocean that are framed beautifully by white sand beaches, the tropical climate that allows fantastic blooms to erupt from exotic plants and the friendly locals that welcome you to their enticing island are all characteristics that put off an amorous vibe. Four Seasons has created an environment that not only captures the allure of Bali, but also provides guests with the ultimate in posh resort services and amenities. Everything and anything you could ever desire can be found at Four Seasons Resort Bali at Jimbaran Bay, where no detail has been overlooked. Health and well-being were part of the premise of Eat, Pray Love. Finding a connection to your mind, body and spirit are all integral to achieve the feeling of being whole and full of life. Four Seasons has provided guests the opportunity to revitalize their spirits with the impressive fitness center, infinity pool and therapeutic spa. Sweat away your worries in the 1,152 square foot gym or relax by the infinity pool that seems to disappear into the gorgeous waters of the bay. Catch a game of tennis any time during the day or stroll through the grounds and take in the stunning tropical flora that is found around the resort. The Spa at Four Seasons tempts guests with the healing powers of water and traditional Asian rituals. 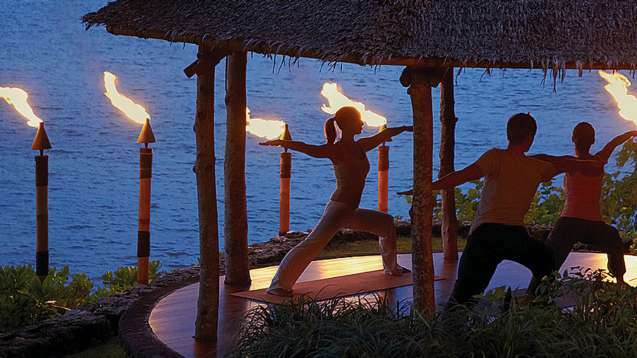 Try out an oceanfront massage or a yoga class with the resort yogis under a thatched roof, all ways to detox and cleanse your body and mind. Renew your soul with the help of Four Seasons and the island of Bali. World -class cuisine can be found at any of the amazing restaurants at Four Seasons Resort Bali at Jimbaran Bay along with some pretty incredible views. Enjoy tastes from Bali's home country of Indonesia, tantalizing Thai and some traditional global fare. Choose a beachfront setting or open air setting and share an unforgettable meal with your travel companions. If you want to enjoy a pre-dinner drink or a nightcap, head to the Terrace Bar and Lounge where you can experience comfortable seating in these Balinese inspired pavilions with extraordinary view of Jimbaran Bay. Sip on a passion fruit martini and maybe a light dessert while you enjoy the ambiance of the lounge. Of course if you're in search of an intimate dinner setting, have your meal served in your villa and enjoy amazing dishes from the privacy of your own suite. Delicious food and beverage are necessary when you long for a memorable vacation and Four Seasons offers that up in abundance. The villas that are found at Four Seasons Resort Bali at Jimbaran Bay were created to emulate the traditional architecture of Bali. Thatched roofs and lush gardens are everywhere, as well as the over-sized indoor and outdoor living areas, courtyards and personal pools. 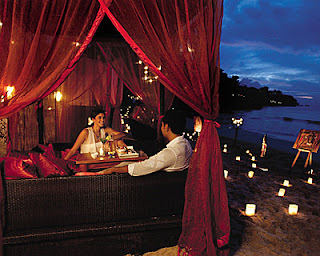 The decor features teak handcrafted furniture and exotic fabrics. Antique artifacts are also used to create a feeling of authenticity. If traveling with your family or a large group, the residential villas offer three or four bedroom options to ensure comfort and privacy. Whatever villa you select, know that all of the incredible amenities will be sure to make you feel completely at home. WhatAHotel! is privileged to be a Preferred Partner with Four Seasons. This partnership means that both WhatAHotel! and Four Seasons share a mutual commitment to experiences of exceptional quality. The Four Seasons Resort Bali at Jimbaran Bay is no different. Book your vacation with us and receive exclusive complimentary perks and benefits that set us apart from other online travel companies. 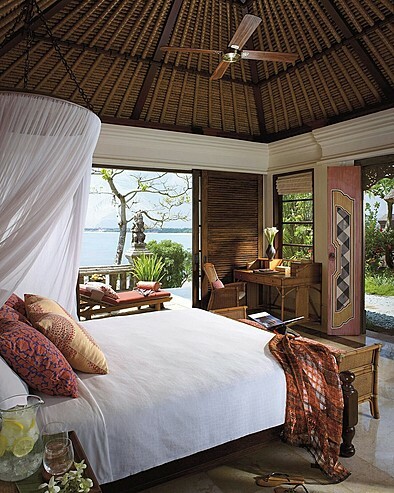 This Indonesian island oasis is ready to induce feelings of pure joy in mind, body and most definitely spirit. 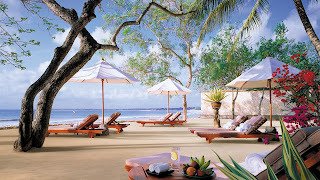 Four Seasons Resort Bali at Jimbaran Bay is awaiting your arrival.